By Kilian Amber Oud is my bottle of the month for March. See it here in all its glory… because this is not the one I have, I am happy that Kilian makes refills as well, and that less glamorous but decidedly more economical option is what graces my perfume cabinet right now. I fell for Amber Oud hook, line and sinker upon first sniff. It was not entirely unexpected, but I still didn’t think that it would be such a great love for me. Thanks to Kilian’s inspired marketing (and accompanying budget, because I’m sure many smaller houses would love to do what Kilian does, but just can’t afford it) many of you have a sample of Amber Oud, but I still want to share a bit of mine for anyone who didn’t get one or can’t get enough. Please leave a comment on this post telling me about your first amber love, or your first experiences with amber as a note. I will draw one lucky winner who will receive a generous spray sample of Amber Oud plus a manufacturer’s sample of Pure Oud. The giveaway is open until April 5 midnight GMT, I will announce the winner here on the blog on April 6. This entry was posted in By Kilian, Collection Photos and tagged Amber, By Kilian, Collection Photos. Bookmark the permalink. First 2 grown up, front and center Ambers, one as bottle, one as decant came same week, 2 weeks ago. They have taken over my life a little bit. Bottle = L’Eau D’Ambre that I bought from the Smell Good, Do Good sale at Scents Of Self and decant = Amber Naguille. Now i understand what you rave about. We are in Autumn now so it couldn’t be better timing. I would love to be in your draw. Those were my first two ambers too! Calling me like a siren. I think my first amber acquaintance (and love) was a rather simple one: l’Artisan – l’Eau d’Ambre. I still don’t own it though. What a great bottle of the month – even in a refill form! Congratulations! My first Amber Love (thanks to you!) is Annick Goutal’s Ambre Fetiche. No need entering me into the draw – I have both the official sample from FB and a sample I talked an SA from Las Vegas Saks into making for me so I’m covered for now. What I am worried about now is Tom Ford’s Amber Absolute: I read it has been discontinued. So now I’m trying to decide if I should buy a decant or to try finding a remaining bottle at one of the stores. I am still looking for the perfect (for me) amber fragrance, and I am undecided between these three: Etro’s Ambra, PdE’s Ambre Russe and TF’s Ambre Absolute. They are all very good and different from one another, so I am having a hard time deciding on just one. Maybe I should buy the least expensive and be a little bit more budget-conscious. Le Feu d’Issey by Issey Miyake.This has notes of white amber and is very unique.A fragrance which is very hard to find as well today. I have never thought of Le Feu as an amber fragrance, but I agree it is a very unusual and beautiful perfume. My first encounter with an amber fragrance was Serge Lutens Ambre Sultan, this was several years ago and I did not care much for it, it has grown on me since then. The second one was Ambre Fetiche from Annick Goutal, did not like that one much either, to much insence for my liking. The one I have fallen for is Hermes Ambre Narguile, I have used up two 4 ml samples and when the winter comes I am sure I will look for a bigger bottle! I would love to try Amber Oud, I have tried several of by Kilian fragrances and I really like them. My first Amber love was Serge Lutens Ambre Sultan . I think it was the first time i ever encountered a challenging perfume. That bitter herbal- medicinal / sweet juxtaposition was something i could not quite get my head around. It is still my favourite to this day. Ah, Ambre Sultan – gorgeous! what a beautiful idea Birgit, once more…..I don’t want to make part of the draw because I had my official sample and it’s been a surprise too for me, because I’m not crazy about By Killian’s scents, as you know, but this one is gorgeous, and because it’s……..just amber, a sweet amber on me and no oud……. I’m a bit surprised and worried to read Amber Absolute by TF is doscontinued, it’s not at all what is said by TF sellers………. I loved very much L’eau d’Ambre by l’Occitane which is really discontinued and crazy by Absolue pour le Soir in which amber is strong for me, AA by TF and I liked so much a vial of Amber burnt by Neil Morris. I knew you are an amber fan, like me. Good to know that you heard differently about the Tom Ford. I hope we’ll know soon. Dear Queen of Amber thank you so much for the generous draw!By Killian never sent me the Amber Oud sample so i’d like to try my luck here. the first amber I fell for was Ambre Sultan by Serge Lutens, but unfortunately I still don’t own it. I’ve always liked perfume but I fell down the rabbit hole in 2010 so my collection is still small. (i own shalimar, dkny gold, scent by theo fenell, tea for two by l’artisan parfumeur, diorella, coco mademoiselle, santal blanc by serge lutens, let it rock by vivienne westwood ,visa by robert piguet ).I wish I could afford a lot more but I need to be careful.I also like Ambre Russe from Perfums d’Empire, Ambre Narguille, Ambre Absolue, L’Air du Desert Maroccain ,in fact amber is definitely one of my favorite notes.Thanks again, i hope i’ll get to try amber oud after all. Hmm, there are gorgeous choices among your amber loves. Good luck, I hope you get to try Amber Oud. I haven’t really found an amber that I don’t like, but my favorite thus far is Luten’s Ambre Sultan. What I love about ambers is that can range from sweet to spicy, but they always bear that unmistakable amber warmth. I haven’t had a chance to sample by Killian’s Amber Oud yet but am looking forward to doing so. I started with Laura Mercier’s Amber Passion, a sweetened and smooth amber for newbies. 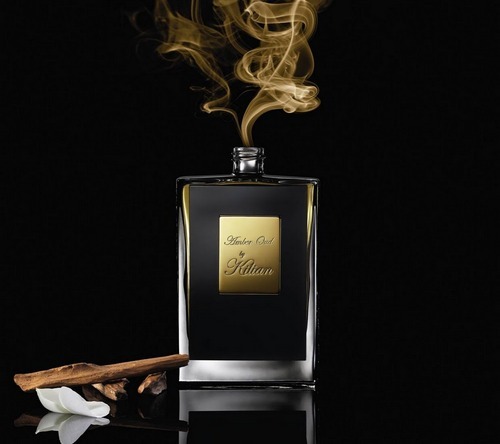 Then L’Artisan Ambre Extreme took the lead, to finally get me to appreciate Ambre Sultan. But I am really curious for Amber Oud, and therefore, thanks for the draw! You are welcome, best of luck to you, Alexandra! So I wasn’t totally wrong with a Guerlain guess! Amber Oud is gorgeous. What a great pick for your March bottle. It’s second only to Rose Oud in the Kilian line-up for me. Good point about BK being able to afford to give samples away like that. I know it’s just not economical for somone like Andy Tauer, for example. I bet many would wish to be able to give samples away, but small one man outfits just can’t. My first amber was Serge Lutens Ambre Sultan was my first amber scent…..to this day, it remains my favorite amber. Amber, as a note, has always worked well on my skin, it envelops me with an “glowing” aura rather than a sillage cloud. that is a great description, that “glow” is what I love about amber as well. My first amber love came not from a perfume, but a sweet little piece of jewelry, that my sister gave me about 15 years ago. It was this tiny little ornate box, that had a simple black cord, to go around the neck. It hit right where my heart is, both figuratively and literally. The box contained amber resin, and smelled divine!!!!! I got compliments all the time when I wore it, which was ALL THE TIME!!!!! I knew then, that amber was my scent. I was saddened one day, when I could not find my necklace, somehow it had vanished, and for the longest time, could not find anything that equalled it, for many reasons. But luckily, I have now, found some amber’s that speak deeply to me, and I appreciate, when I can find new ones, or be directed to an amber that sits close to my heart. I am happy to know that there is a queen of amber who wants to bring light to this amazing accord, and give it the reverence that it deserves. What a beautiful story, Arline! I’m so sorry that you lose that precious necklace. I hope an amber perfume can bring back the memories of smelling that little box full of resin. You know I was thinking yesterday how I can wear anything by Calice Becker and not worry, I will smell great! She’s the only perfumer I can think of that I can buy her work unsniffed and know it’s going to work well with me. No need to enter me in the drawing- I have a sample on the way already! Calice Becker does wonderful work indeed. I like many, but I think Amber Oud is outstanding. I love the smell of amber, it is a haunting smell for me, but I have been having a hard time finding an amber perfume that I like. I did buy L’Occcitains Ambre, which I enjoy, but I’m still on the hunt for more. I’m thinking of ordering an amber sampler from the perfumed court. That is a good idea, sujaan. There are so many amber perfumes out there, and many are quite similar too, so a sampler should give you a good idea of what you like. My first amber was pde ambre russe, I went into amber a bit headstrong, this one put me off amber for the longest time. I dipped my toe back in with amber for cowards, prada l’eau ambre which suited me fine, I then fell for mfk cologne pour le soir although this is not predominately amber, it seems I now like a whole host of perfumes with amber playing a part not the lead, my favourite all singing all dancing amber is amber naguile but on the bf not myself. I’m glad you now have a bottle of Amber Oud! My first amber love was Opus VI, I liked others before it but it was the first amber to get under my skin and make me love it. My first amber love was Ambre Narguile, and it remains the only amber in my collection so far. I would love to try Amber Oud, I still haven’t got around to trying the By Killian scents yet. Good luck to you then Eva! I hope you get to try it. My first experience with amber was the Kuumba Made Amber Paste that can be found in food co-ops or the Whole Food stores that have replaced them. How interesting! I wish I could smell that. I started going for ambers as soon as I started going for perfumes, one of my first bottles was a *gasp* Bath and Body Works Sensual Amber! 🙂 Well, after that I smelled L’Occitane Ambre and realized that the Sensual Amber is more about fruit and praline, and amber scents are dark, tantalizing journeys. I am still looking for a perfect amber and treasure my little Amber sample pack: Ambre Fetishe, Burnt Amber by Neil Morris, Ambree Ceruleen, Ambre Sultan and L’Desert du Maroccain (the last two I was really scared of at first). My first amber love happened just this week. I’ve always enjoyed my amber samples, but was content to try them and move on. In some ways, amber perfumes are so easy to like they never moved into FBW; incense and spices are what get my motor running. On Monday I tried Ambre Fétiche for the first time, spraying from a generous sample that Dee sent me. Tuesday I bought it. It’s the first time I’ve ever done something like that. I don’t have anything with amber as a primary note, but I love the warm amber in Montale Deep Roses… I’d love to broaden my collection. Thank you for your blog! Please include me in the drawing… I don’t have anything with amber as the top note but I’d love to broaden my collection. I do love the warm amber in Montale Deep Roses. My first real amber love may even be as recent as my sniffing trip with Tara when I encountered Ambre Nuit. Prior to that we might be talking Marc Jacobs Amber, which some might say – due to its splash concentration – is merely on nodding terms with the note! There are many perfumes I love with amber in the base though you wouldn’t call them amber scents as such. You are included in the draw, I know you’d appreciate Amber Oud. It is soft and tender. Yep, “soft and tender” sounds just the ticket, thanks! My first real amber experience was with Ambre Sultan, now I have so many favorites along those are Ambre 114, Amber Absolute, Mitzah, Bois d’Armenie and Cologne Pour Le Soir. Lovely choices, Roberto! Good luck to you! Ambers I like include Ambre Sultan (herbal amber, and almost over my maximum “core sweetness” tolerance limit), Amber Absolute (perfect dry amber) and Ambre Soie (light silky anise-chocolate amber). I’ve been trying to find Ambre Fetiche from my “purgatory” sample box but the sample seems to have vanished… I don’t remember what bugged me about it back in the day when I tried it first. I also had a tiny 0,7ml sample of Amber Oud but it’s already empty and I’m left desperately sniffing the empty vial… I actually feel that this might be The Amber for me, but I want to test it and live with it more before I commit to a full purchase, as the price is really quite ridiculous! From the little sampling so far I’ve found Amber Oud to balance sweet, spicy and resinous elements perfectly, with just right overall volume. Recently I’ve also sampled and enjoyed Arquiste’s Anima Dulcis which is a spicy gourmandy oriental with a light amber background. I don’t think of it as a “proper” amber perfume, but I highly recommend trying it. Thanks for the draw! you seem to be an amber connoisseur. I know what you mean about the overwhelming facet some amber perfumes can have, Amber Oud is definitely not one of those. I heard mayn good things about Anima Dulcis, I look forward to trying it eventually. Best of luck to you in the draw! of the park. My first Oud sample! “I like what I like” – I love that, that is what counts. I’m glad you like Amber Oud as much as I do. I haven’t tried it yet so I’d love a chance. My first amber was L’Eau d’Ambre by L’Artisan but the one that was eye opening was Ambre Sultan. What a wonder! Ambre Sultan is indeed an eye-opener, I think it is my favorite Lutens. A great perfume! Good luck! Attrape Couer was my first amber. I agonized over the price of the bottle and finally bought it, thank God for making the right decision while I had the chance! I haven’t always done so! But, honestly, it was such a good investment! I wear it so much in cool weather, and the beauty of it is that, living in Los Angeles, there are huge swaths of the year when it is too hot to appeal at all, so I think my bottle will last a while. I also really like Nobile 1942’s Ambre Nobile. It is on sale right now at Luckyscent, and is so tempting, but I’m thinking I should probably save my money for Trayee, instead. All these painful choices:)! Oh wow, what an introduction to amber. I’m glad you have a bottle. Attrape Coeur is so beautiful! I would absolutely LOVE to try this!! My very first amber was Auric Blends Amber. I was so young! Now I’m all grown up and dying to try this one! I first discovered amber in Balmain’s Amber Gris and couldn’t get enough after that! Ambergris is a very yummy scent. I hear many good things about the L’Occitane amber, Laura! I love amber in most of its forms (my favorite spring amber is Nicolaïs orange amber New York – it works very well in Rome when spring temperatures soar and many other ambers suffocate). One of my winter favorites is Ambre Sultan. But yesterday I met an amber I do not love: Profumi del Forte’s Ambra Mediterranea. Too strong and exotic for my Nordic nose. Amber Oud would be quite weaeable in the hot Roman summers, I bet. Good luck to you! I would ask humbly to be entered this giveaway , as I did not received the memeber’s sample as promised. A very generous price draw indeed! It is difficult to remember which of my Amber scents was the first one. However my favourite one is amber narguile. Thanks to you that is. I smelled amber oud and was very tempted to buy the refill bottles too, but feeling a little poor recently so thought it might have to wait. So i would of course love to get lucky in your price draw. Hi Eva, I’m glad you still love Ambre Narguilė. I’m feeling a bit poor too these days. 😉 Best of luck! Whoa, I’m late! Sorry B! My first amber scent was probably Caswell Massey’s Tricorn (amber & sandalwood) in the 60s or 70s. Amber has been one of the predominant accords in my perfume wardrobe ever since, along with sandalwood, patchouli, assorted desert resins, and more recently, incense. Thanks for the draw. You’ve been a long-time amber lover it seems. You’re in the draw, Julie! I am brand-new to perfume and am greatly enjoying the experience. Serge Lutens Amber Sultan, Parfums d’Empire Ambre Russe, and Hermes Amber Nargile are on my Ambers list, as is the by Kilian Amber Oud. I’ve been enjoying your blog quite a bit! Hi Christy, lovely to meet you! Your amber list looks good. Hi- I am a bit of a novice with higher end perfumes but am anxious to experience more. Tom Ford’s Amber Absolute is the first thing that comes to mind. Your blog is wonderful and overwhelming at times. Thank you. I am very new to this- last week I got my first samples from Sonoma Scent Studio, including the amber. I love orientals and incense and wood, and am still a bit confused by what crosses the line into “amber” territory if it does not include the word in the name. SSS Ambre Noire is a great starting point. I guess I’m one of the few who hadn’t recieved a sample from them. I’m holding my fingers crossed ;-). My first amber love was Donna Karan Gold, a lily scent with an amber drydown. So yummy! It’s still a top 10 perfume for me. I also love L’Air du Desert Morocain and many other ambers. Thanks for having a drawing! My first amber loves were SSS Ambre Encens and MPG Ambre Precieux. I believe that the Ambre Encens is discontinued now, but I still have a small rollerball of the oil, and it is so soft and warm. The Ambre Precieux has a lovely lavender note to go along with the warmth of the amber. I really don’t have many amber fragrances in my collection, and now I am wondering why not? ?